Lionel Messi believes he was fortunate to score two tremendous free-kicks during Barcelona's win over Espanyol in LaLiga on Saturday. 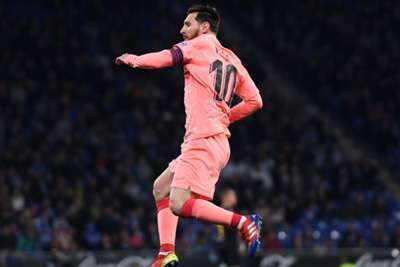 Just days after being criticised by Brazil great Pele, Messi produced a fine display, scoring twice and setting up another in Barca's 4-0 win. His two goals were wonderful free-kicks, but the 31-year-old said he needed some luck. "I try to follow a routine a bit, trying to do it the same way so that it goes well again," Messi told Vamos. "Other times I have a lot of free-kicks and I do not put them in. I was lucky enough to get two in a row." Ousmane Dembele and Luis Suarez also struck for Barca, who were 3-0 up at half-time in the derby clash. With his team three points clear at the top, Messi praised their performance, saying: "We came out very strong to dominate the match from the start. "We kept the ball, we knew how to take it from the rival and Espanyol, without the ball, they suffer. "They press high and we were superior at all times."